Any way to get 200 of these envelopes in bright yellow? We are mailing a magazine that is 9.75 x 13.5, so looking for bright yellow envelopes that will fit, so doesn't have to be this envelope particularly. We have 10 x 13 clasp open end envelopes in brite hue yellow found here: https://www.jampaper.com/ecom/index.asp/show/detail/cat/52/prd/15/c/13781/s/7407 If this is a good fit for you, call our customer service line at 1-800-8010-JAM to see about stock. Thanks so much! It all depends on if you have FedEx, UPS, etc. Also, when you need it by. We suggest calling our customer service line 1-800-8010-JAM for specific inquiries. Whether you're white-collar, blue-collar, or no collar, these white envelopes will compliment your office supply style. These big sized envelopes are great for when you want to store your confidential documents inside without having to shove them in or bend them in any way. These envelopes will organize your office and keep it pure and simple. Speaking of simple, the white color will simplify your cluttered desk all the while storing what needs to be put away. With the envelope's smooth finish and straight flap, you can't go wrong. Whether you decide on the gum closure or want to go for the peel and seal closure, your documents will stay intact and protected. Both featuring an Open End feature that lets your documents be vertical and ready for takeoff. Don't go without the classic white envelope. Every office needs one. 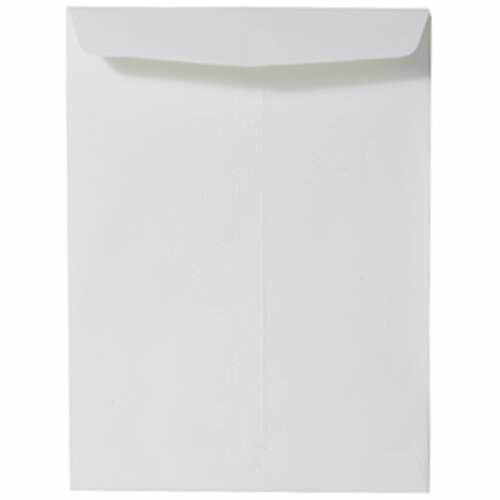 These large white mailers measure in at 10 x 15 inches and feature a rectangular gummed flap closure.